Using my Jewellery scraps again this week! But making an entirely different brooch, using sewing instead of wire and metal! For me, when it comes to craft, hand sewing beads is the most time consuming and patience testing, but the end result is so worth it. In this case, I started off with a felt shape of a ribbon and then using beads from broken/ unwanted jewellery I embellished the felt. I then sewed on this gem in the middle (from an old plastic ring!) 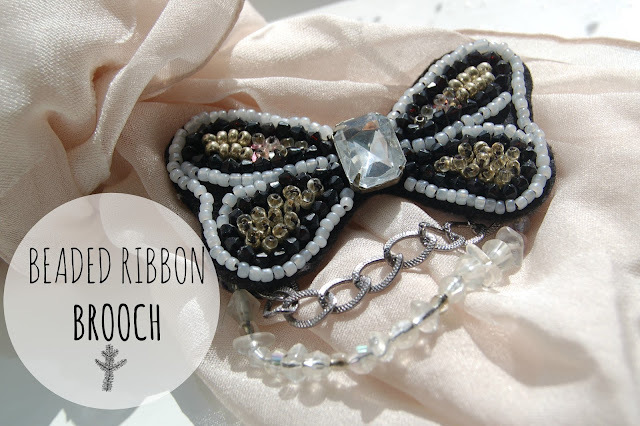 and sewed on old bracelets so they create a nice loop under my brooch! And tadah- using scraps is completely worth it!! !